Provide comfort for the family of Mae Lyke with a meaningful gesture of sympathy. AVON/WEST RUSH - Mae went home to be with her Lord and Savior on December 10, 2018 at age 101. Predeceased by her husband, Leland and daughter, Judith; grandson, Gerald (Sam) McDonald; 2 brothers; Harry Milliman, Frank Milliman, 6 sisters; Alice Weber, Lottie Bates, Clara Conroy, Rita Barker, Shirley Theetge, Charlotte Carey. 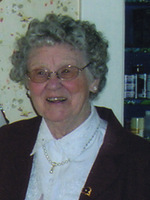 She is survived by her daughters, Janet (John) George and Carol (Warren) Kime; 11 grandchildren; Elaine Stanton-Hicks, Richard Stanton, Susan Stanton, Michelle Wrightman, Lori Mosbacher, Michael Kime, Cynthia Doolittle, Bonnie MacLeod, Elizabeth McDonald, John McDonald; 22 great-grandchildren; 10 great-great grandchildren; many nieces and nephews and her loving church family. Family and friends are invited to attend her Memorial Service, Saturday, December 15, 2018 at 11 AM at Cornerstone Baptist Church, 4232 Reservoir Rd., Geneseo, NY 14454. Private interment. Memorials may be made to the Church to support mission work.